Today, on the eve of Republic day, our office had special lunch arranged to celebrate this occasion. We had some extra food added to the menu along with a tri-color ice cream. While I was eating my piece of melting Ice-cream, a thought came across. Are we limiting ourselves to celebrate our national days with just mere colors or it is more than that? When I asked few of our colleagues, why are we getting ice-cream in three colors? They shook their head and told that because it's Republic day Lunch and we have a holiday (No work) tomorrow (26th January). 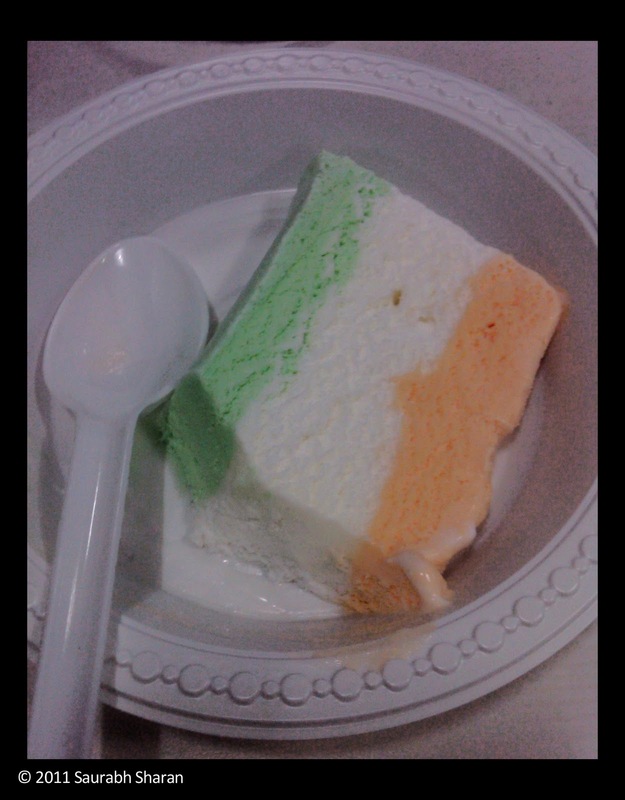 I was very surprised to accept that simply converting an ice cream into a tri color will never show our patriotism. We should be aware of what color represents and why? Indian National Congress during the independence movement always wanted a national flag to gain prominence from British dominions. Everyone including Tilak and Bankim Chandra had some or other images for the National Flag. Not a single flag design showed the real India and its diversity. Either they were Hindu -Centric or a copy of Union Jack. Mohandas Karamchand Gandhi advocated about the need for an Indian flag, proposing a flag with the charkha or spinning wheel at the center.The idea was to design a flag with the spinning wheel on a red and green color signifying Hindus and the Muslims respectively. Due to the presence of other religions in India, Gandhi was forced to elaborate the White color as the other remaining religions. This also didn't go well with the religious sentiments. This move was criticized heavily as the Sikhs wanted to include the black color. Finally, owing to the religious-political sensibilities, in 1929, Gandhi decided a more secular approach of the use of colors. He interpreted that red will stand for the sacrifices of the people, white for purity, and green for hope. Later Nehru along with Patel, improvised the Gandhi's Spinning wheel flag into the 'Swaraj' Flag and the Red banner was replaced by Saffron and moved towards the top, while Dark Green banner was below. White was kept between with the spinning wheel. After India's Independence, the flag committee, replaced the wheel with the chakra. this was done to bring the symmetry to the flag and explained as the representative of dharma and law. The flag was designed by Pingali Venkayya, an agriculturist from Machilipatnam. While the color scheme, saffron, white and green were chosen for the three bands, representing courage and sacrifice, peace and truth, and faith and chivalry respectively. Later the charkha was replaced by the Ashoka Chakra representing the eternal wheel of law in blue. “Bhagwa or the saffron colour denotes renunciation or disinterestedness. Our leaders must be indifferent to material gains and dedicate themselves to their work. The white in the centre is light, the path of truth to guide our conduct. The green shows our relation to (the) soil, our relation to the plant life here, on which all other life depends. The "Ashoka Chakra" in the centre of the white is the wheel of the law of dharma. Truth or satya, dharma or virtue ought to be the controlling principle of those who work under this flag. Again, the wheel denotes motion. There is death in stagnation. There is life in movement. India should no more resist change, it must move and go forward. The wheel represents the dynamism of a peaceful change." I remembered these words and looked at my ice cream plate, smiled and ate the last remaining cold bite. Still the Saffron represents Hindu and Green represents Muslim.